EnFiniti™ edge-to-edge multifaceted polycarbonate lens creates low glare and halogen-like appearance. Thermoplastic body aluminium heat-sink. 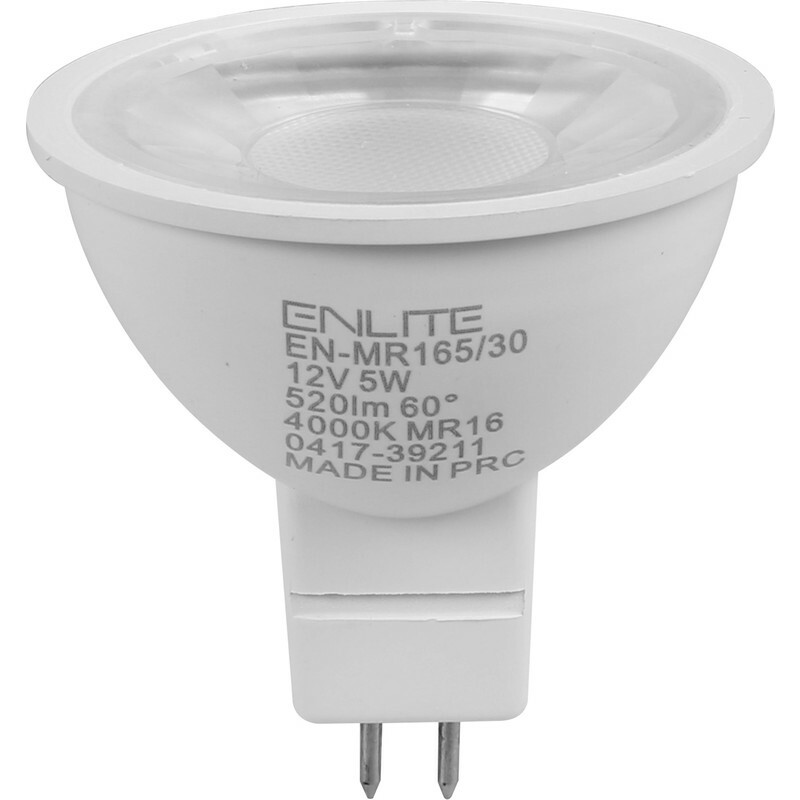 Enlite LED 5W MR16 Lamp Cool White 520lm is rated 4.1 out of 5 by 10. Rated 5 out of 5 by Benmak77 from Excellent Services The order had been delivered promptly. The bulbs are of high quality and at a very reasonable price. I will consider to re-order again in future. Rated 4 out of 5 by Ancient engineer from Good beam angle. This particular MR16 was purchased to fit a shower light fitting. Much better & coherent beam spread, but unfortunately physically a couple of millimeteres deeper, front-to back than a standard MR16. Why do they do this?. It means that the face of the lamp no longer sits flush with the rim of the fitting. It remains to be seen as to whether dust entering from the integral fan duct will fill this annoying gap & cause any problems. Rated 5 out of 5 by Bumpa from Brighter than average Excellent bulb for our kitchen downlighters. Brighter than average with a wide beam pattern. Ideal. Rated 5 out of 5 by Snurge from Nice warm colour. You can't go wrong with Enlite/Aurora lights and lamps. These have a warm, amberish quality to the light. Rated 5 out of 5 by Martyn79 from Amazing light I have bought 12v and GU10 versions of these bulbs, the light they give out is amazing compared to any LED bulb I've previously encountered. I did have 2 12v lights that flickered but I assume this is the age of the transformer and not a fault with the bulbs. Highly recommend these if you want lots of light.